“Out of Orbit” and “Unlikely Allies” are the stars of the group. * “Bottled lightning: Superbatteries, Electric Cars, and the New Lithium Economy”:amazon by Seth Fletcher. Decent nontechnical book about the lithium battery and lithium production. Entertaining intro to the topic. Amazon gives it 4 stars, I’d say 3.5, would have liked a little more technical depth. * “Where’s My Jetpack”:amazon by Daniel H. Wilson. Short essays on the Jetpack, moving sidewalks, and other promised tech from sci fi. Kind of bland. Amazon says 4 stars but I’d say 2. Maybe if I didn’t already read a lot of scientific literature and science fiction, I’d like this. But I suspect all the readers of this book have a science/science fiction bent. * “Out of Orbit”:amazon by Chris Jones. Terrific true story about shuttle/international space station astronauts. Really digs into the emotional side of their trips, the highs of space travel, the lows of dealing with isolation and with the loss of colleagues in the shuttle disasters. Very compelling. Amazon says 4 stars, at least that. 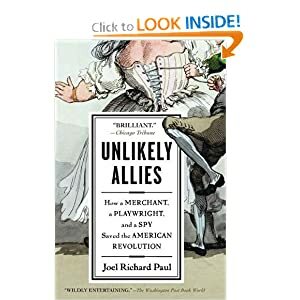 * “Unlikely Allies”:amazon by Joel Richard Paul. The story of an American and two Frenchmen during the Revolutionary War, and their involvement in securing the support of France — both diplomatic and material support. Fascinating look at a facet of the war that I knew little about. Amazon says 4.5 stars, I’m good with that. * “Introduction to Spintronics”:amazon by Supriyo Bandyopadhyay, Marc Cahay. This book is a good introduction if you already have a solid technical foundation in quantum mechanics at the graduate level — be prepared for a lot of math. If you want a nontechnical intro to spintronics, look elsewhere. Amazon says 5 stars but that is based on a single review. It is a very solid book though.